Moisture and softness with Hibiscus Marshmallow Leave-In Conditioner by Ynobe Shop. Deciding between Havana and Marley twists? We break it down in this easy guide so you can decide what's best for your hair. 15 All-Time Favorite Curly Products - From Our Top Product Reviewer! Our veteran reviewer Laurabeth knows what she's talking about. Her are her favorite products. Can Hair Get Used to Shampoo? We all suspect it, but is this hair myth true? A cosmetic chemist weighs in. Introducing Spiralicious, Jessicurl's New Gel! Use extensions with care, and they can be a hair healthy solution to your long hair envy. If you're still on the fence about going natural, read this. Your curls will thank you. Do these 100% vegan curly hair products stand up to their product claims? Thousands of NaturallyCurly community members have taken the time to share their favorite products, tools and necessities for curly, coily and wavy hair. See what they voted for today! A fun flashback to the NaturallyCurly team back in the 90's. Look how far our curls have come! Curlies use lots of different brands, and product rotation is key. These interesting insights and more about the curly world! The top reviewed curly products in NaturallyCurly history. What if Curly Hair Was Mainstream? Imagine a world where curly hair was the norm. What would it look like? The #curlyhair Instagrammers we like, comment, and follow. Did your favorite make the list? Moptop founder Kelly Foreman shares her views on how the curly world has grown, and our greatest challenges! NaturallyCurly Co-founder Michelle Breyer reflects on the most important lessons she's learned about the curly world. Give your curls shine with Deva's brand new Shine Spray. Ever tried showering with a hairnet? Do you "scrunch-squeeze" your curls? If not, you need to know these tips. Purgasm's Wild Cherry Hair Truffle sounds good enough to eat, but what does it do for your curls? After coloring and straightening her hair for years, Lauren's curls are frizzy and undefined. Ekta's school didn't approve of her curly hair, but she insisted her curls were a part of her, and her personality! The 15 curly haired YouTubers we watch day and night. 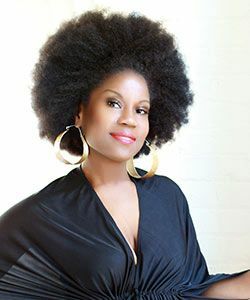 Karen dishes about her 'fro, going natural, and why "Real Hair Talk" is so important. Take a fun look back at life before NaturallyCurly. ANTM contestant Renee Bhagwandeen is often asked to straighten her curls for modelling, she tells us about her experience as a curly model. Christina tried Obia Natural Hair Care on her curls, here's how it measures up. Japanese test out no-poo for baldness and thinning hair.